Wishing you a day full of bright and cheerful moments! Today, enjoy one of my favorite recipes! It is always a crowd pleaser!!! Wash and thoroughly dry the wings. I separated the wing and the drumette, using a very sharp knife AND BEING extremely careful! Even drying the wings well they were still a tad slippery. I also cut the tip off the wing. Place the wings and drumettes in a bag and add a very small amount of olive oil, salt and pepper. Place on a stone and bake them at 400 degrees for 40 minutes. Remove from the oven and immediately place on a plate with paper towels to soak up some of the grease. They will be nice and crispy! Serve with the sauce! YUM! 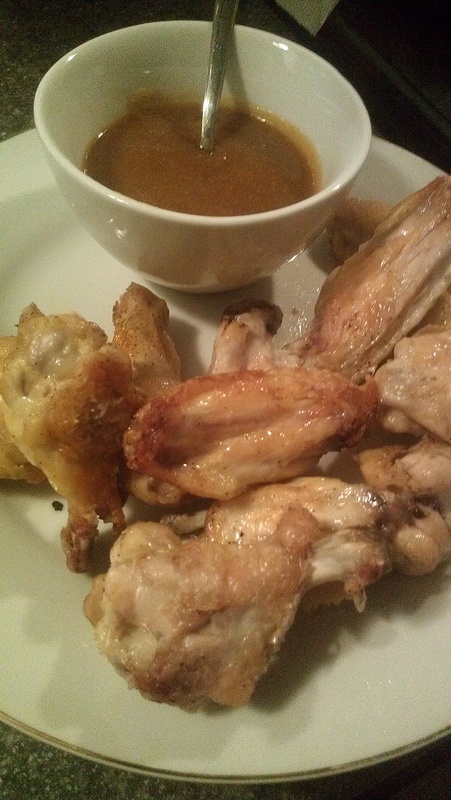 For the spicy wings: once removed from oven and blotted with the paper towels, place the other half in a bowl and pour Sweet Baby Ray’s wing sauce over! These are VERY VERY spicy! Stir all ingredients in a small sauce pan over medium heat for 5 to 10 minutes.